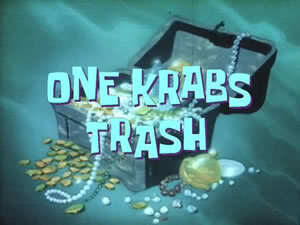 One Krab's Trash (Episode) – From SpongePedia, the biggest SpongeBob-wiki in the world! Mr. Krabs comes out his house and opens up a "fine antique" sale full of trash, and he used a fresh scent can to spray away the stench. He sells an umbrella with holes to Dennis. Mr. Krabs said that the hat belonged to the queen of Switzerland. Dennis did not believe him a bought it for a bargain. He told Mr. Krabs Switzerland does not have a queen. Patrick buys the toilet plunger he threw out yesterday. SpongeBob buys a Soda Drink Hat. Later, Krabs meets some collectors who tell him that the hat is worth $1,000,000! Mr. Krabs, as we all know, is obsessed with money. He goes to SpongeBob and says he looks like a girl if he is wearing the hat. It does not work, so he offers to give SpongeBob all the hats in the paper bag that he is carrying in exchange for SpongeBob's hat. SpongeBob says that he would not give the hat to Mr. Krabs, so at night, Mr. Krabs draws a ghost on a piece of paper and hooks it on a fishing rod. SpongeBob thinks it's really a ghost. Mr. Krabs tells him that the hat once belonged to Smitty Werben Jegar Man Jensen, a dead guy buried in a nearby cemetery, and that the hat is cursed. SpongeBob buries the hat where Smitty's grave is. Mr. Krabs is shocked that there really is a Smitty Werben Jegar Man Jensen but goes to the cemetery anyway. He defiles the grave and gets the hat. What he does not know is that there really is a curse and Smitty commands the other zombies to get the hat back. Mr. Krabs grabs the head of an undead swordfish, and uses that as his sword. He eventually defeats the zombies. He then goes to the collectors and tells them that he got the hat back. The collectors tell him that they found a warehouse full of that kind of hat and that the hat is worthless. The collectors see SpongeBob wearing a clapping hat and they chase him to tell him it is expensive and they want to buy it. Mr. Krabs cries and Squidward, who is bringing flowers to Squidward's Hopes and Dreams' in the graveyard, says "What a baby." The title is a parody of the phrase "One man's trash is another man's treasure". Originally, SpongeBob says "You'll never guess what I found in my pants last night". However, because people thought it sounded suggestive, it was changed to "You'll never guess what I found in my sock last night". When Mr. Krabs puts the ghost he drew on a paper on a hook and moves it towards SpongeBob, SpongeBob screams, "A floating shopping list!" You can tell that his bed is not on the first floor, but on the second floor. This is one of the ten episodes in which the title card has an animation. The others are SB-129, Pre-Hibernation Week, Idiot Box, SpongeBob Meets the Strangler, Skill Crane, Karate Island, All that Glitters, The Donut of Shame, and The Krabby Kronicle. When Mr. Krabs is digging up Smitty's grave, there are 3 tombstones. Then, when he gets back up, there are 4 tombstones and a statue. The battle of Mr. Krabs vs. The Dead Skeletons is a parody of Pirates of the Caribbean. The skeletons that came to life was a reference to Night of the Living Dead, as Smitty Werben Yegger Man Jensen said. Mr. Krabs said that the soda hat belonged to a "Smitty Werben Yegger Man Jensen" and yet when he looks at the grave it says "Smitty Werben Man Jensen". This page was last modified on 3 October 2010, at 19:20. This page has been accessed 28,076 times.